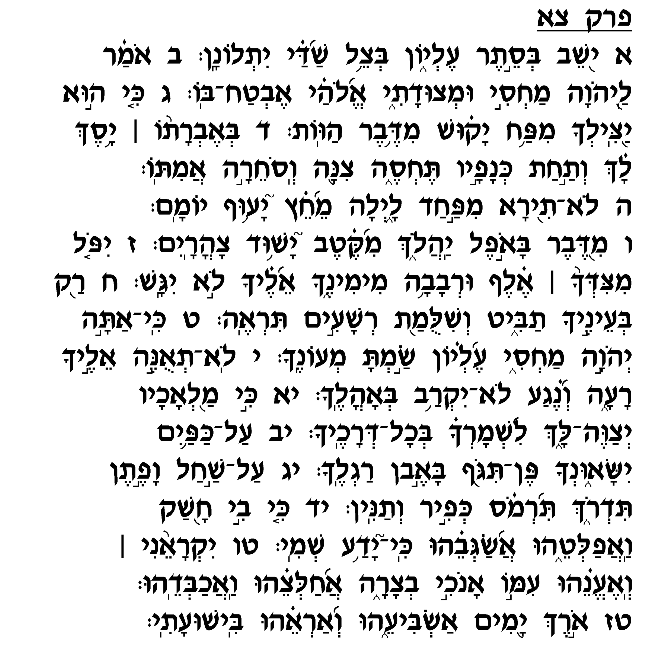 This chapter, the second of the eleven Psalms attributed to Moshe Rabbenu, extols the good fortune of the "Yoshev Be'seter Elyon" – "he who dwells in the shelter of the Supreme One" (verse 1). The commentaries generally explain this as a reference to the pious Jew who devotes his life to the sincere service of his Creator, rather than to the endless pursuit of the vain pleasures of the world. Such a person places his trust in the Almighty, rather than in the less reliable sources of security, such as wealth and physical strength, and is rewarded with the special protection of the Almighty. Moshe here lists numerous kinds of calamities from which such a person is spared, including enemy traps, disease, and even harmful spiritual forces. God is compared in this chapter to a "shield" and "armor" that covers the entire body (verse 4), such that even if thousands of people fall in battle around this individual, he will emerge unscathed (verse 7). This person is so assured of God's protection that he can even tread upon the openings of snake-holes without any fear or concern (verse 13). This Psalm is traditionally recited on a number of occasions as part of the regular prayer services, including during Keri'at Shema Al Ha'mita – the nighttime Shema service. The inclusion of this chapter in the nighttime Shema is likely due to verse 5, which declares that under God's protection one need not fear the dangers that lurk in the nighttime darkness. More generally, this chapter as a whole conveys the message that a faithful servant of God does not experience fear during the "dark" periods of life, when one is beset by uncertainty and concern. Even in situations of danger and anxiety, he can feel confident in God's ability to help him overcome the obstacles he confronts and avoid the dangers that lurk all around him.